Listed below are answers to our clients’ most frequently asked questions. These answers are especially helpful for new customers. If you need more details about any of these answers or have questions that aren’t covered here, please call us at 952/892-6943. Does CompanyNewsletters.com offer prewritten or preproduced customer newsletters with generic articles that we can simply put our company name and logo on and send out? If we hire CompanyNewsletters.com to write articles for our newsletter, how do you come up with the content? I need to send CompanyNewsletters.com some articles and a mailing list for my newsletter. How do you prefer to receive them? Are customers required to sign any type of long term contract with CompanyNewsletters.com or do they have to commit to a certain number of issues? Can we send you photos from a digital camera to use in our newsletter? How can I view online color proofs of the printed newsletter that CompanyNewsletters.com is creating for me? Q: Does CompanyNewsletters.com offer prewritten or preproduced customer newsletters with generic articles that we can simply put our company name and logo on and send out? A: No, CompanyNewsletters.com only produces custom newsletters, with a design and articles tailored to the wishes of each client. You will find that a custom newsletter with content that is relevant to your specific company, employees and customers is much more effective and generates more positive results than a template newsletter with generic content that looks exactly like other companies’ newsletters. With a custom newsletter, you’ll have a unique, one of a kind design that stands out from your competitors’ newsletters. More importantly, you can feature custom articles that provide benefits to your company. For instance, you can drive sales and gain new customers by featuring “customer profile” articles, where your best customers are interviewed and quoted as to why they prefer your company’s products services and employees over your competitors. Learn more about the different types of results-oriented articles that you can feature in a customized customer newsletter that we can help you produce. Q: If we hire CompanyNewsletters.com to write articles for our newsletter, how do you come up with the content? A: At CompanyNewsletters.com, here’s how our writing services work. We request that the client first puts together a list of articles they want written for each issue, along with contact people who our highly experienced business writers can interview for each article. For instance, if you want an article on a new product that your company is offering, you may want us to interview your marketing manager, as well as one of your customers who has tested the new product and had great results. The writer will then write an entertaining, informative article based on what was learned in the interview, quoting the interviewees when appropriate. Learn more about our writing services and how we produce your articles. Q: I need to send CompanyNewsletters.com some articles and a mailing list for my newsletter. How do you prefer to receive them? A: The quickest, least-expensive and most convenient way to send us your information is to e-mail the files to us. You can send text files in any common word processing format, such as in Microsoft Word format (.DOCX). For mailing list files, you can send those in any common format, such as in Microsoft Excel format (.XLSX). Q: Are customers required to sign any type of long term contract with CompanyNewsletters.com or do they have to commit to a certain number of issues? A: No, when you hire us to provide newsletter services, you are not locked into any contract for a certain number of issues. 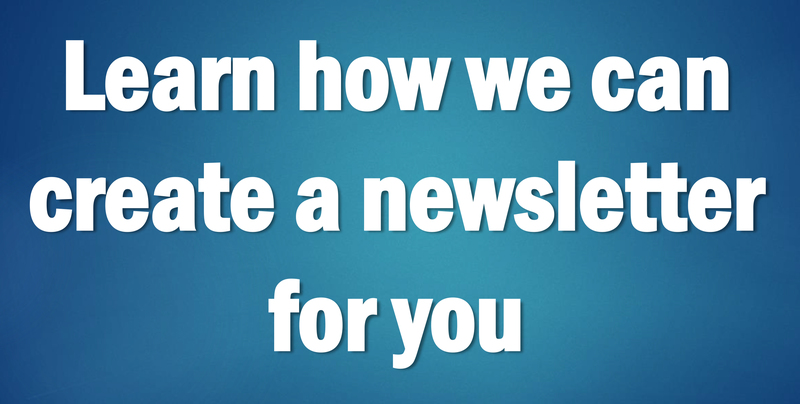 We produce your newsletters on an issue-by-issue basis according to your timeline. You are free to do just one issue with us, if you’d like. Or if you are hiring us to produce a quarterly newsletter, and your budget is too tight to do the 4th issue, no problem to skip an issue and continue at a later time. Q: Can we send you photos from a digital camera to use in our newsletter? A: Yes, photos will really dress up your newsletter and we highly encourage clients to take photos and send them to us to run in their newsletter. In fact, here are some helpful tips on how to take great photos for your newsletter while making sure you have enough resolution so they reproduce crisply. You can email photos to us in any common photo format, such as .JPG files. Because photo files are quite large and we have an incoming limit on the size of emails, please do not email more than three photos at a time to us. You can also avoid using email and send them to us all at once using a file sharing service. One such free service that we like is WeTransfer. Q: How can I view online color proofs of the printed newsletter that CompanyNewsletters.com is creating for me? A: Detailed directions for viewing your online color proofs can be found here.